The Spinners Arms is a popular community pub with its own pool and darts teams, SKY and BT Sports entertainment and supports local causes with fundraising activities. During the summer, Adam and his team also organise outdoor events for customers in the beer garden such as music festivals and will create a buzz around celebrations such as Easter and Mother’s Day throughout the year. 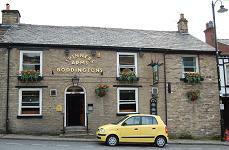 This warm and friendly pub sits right in the middle of the main shopping street with a large public car park opposite. Brews: Boddingtons, Tetley Mild, Carling, Stella, Caffry’s, Guinness, Strongbow. Has guest cask ales and is Cask Marque accredited. Food: Menu, with small premium snack items featuring burgers and nibbles. Other facilities: Pool table, two dart boards, and for fine weather, a nice garden area. Finding it: In the main street of Bollington, opposite Pool Bank car park.